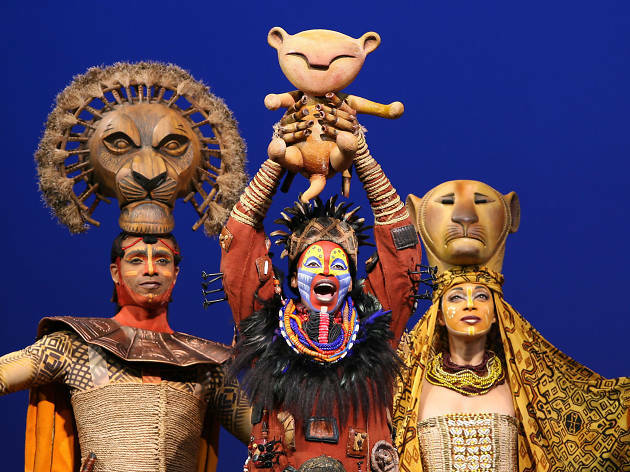 Director-designer Julie Taymor takes a reactionary Disney cartoon about the natural right of kings—in which the circle of life is putted against a queeny villain and his jive-talking ghetto pals—and transforms it into a gorgeous celebration of color and movement. 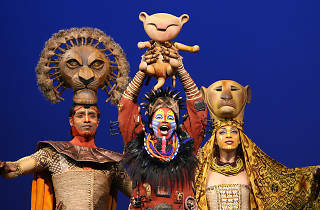 The movie’s Elton John–Tim Rice score is expanded with African rhythm and music, and through elegant puppetry, Taymor populates the stage with an amazing menagerie of beasts; her audacious staging expands a simple cub into the pride of Broadway, not merely a fable of heredity but a celebration of heritage. Minskoff Theatre (Broadway). Music by Elton John. Lyrics by Tim Rice. Book by Roger Allers and Irene Mecchi. Directed by Julie Taymor. With ensemble cast. Running time: 2hrs 40mins. One intermission. There's a reason the show has been running for 20 years. Its a great show. great acting, great music, great seats, great everything. Its worth every penny. Did you see the Lion king? It’s a Broadway show! Broadway show are so fun! It’s in New York! The monkey is funny! The monkey has a stick. The monkey is beautiful. The monkey lives in the tree. Scar is not nice. He is a lion. He is a bad guy that makes the show fantastic! Did you see Scar before? He is beautiful. He does not like the Lion king’s dad. Also, the hyenas are not nice. They make the show sad. The hyenas are beautiful! They have sharp claws! The Lion king is so cool! You should seat next to the aisle because you can see the characters when they are going to the stage. I give the Lion king 5 thumbs up! Quite possibly the most magical thing I've ever seen on Broadway, and perhaps in life! And the best parts are in the first 10 minutes, so don't be late! (I can't believe anyone is ever late to a Bway show, but it never fails) I understand why its been on stage for so long, I could see this several more times! What talent all the performers must have as dancers, singers and puppeteers! Not a bad seat in the house as the sets and character are larger than life, you won't miss a thing, even from the back! Truly dazzling! It's a wonderful experience at any age. This show is magical! Mass produced kitsch that never fails to pull on the heartstrings and invoke real emotion. Amazing production with childhood Disney magic included, nostalgia abounds in story, song, and beautiful aesthetic. The costumes need to be seen to be believed. The orchestra and theatre itself immerse the audience in the jungle, with the whole space felt and heard. Would see again and again. One of the most moving shows you will see on broadway. The cast is amazing, costumes are even better, simply a stunning show you will never regret seeing. You will want to keep going back, definitely a must see if you are looking for a broadway stunner. Best show ever!!!! U MUST SEE!!!! !